Europe is facing inequality levels that bring us back to the 1930s. Many southern European countries are facing a humanitarian emergency. The debt crisis caused by transfers of wealth from the public to the private sector has been dramatically reinforced by the austerity measures. We need a real social inclusion strategy for the EU and a major shift in its political orientation. 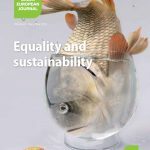 Green European Journal: The second edition of the Green European Journal published a debate with Romuald Jadgodzinski, an advisor at the European Trade Union Institute, and Jean Lambert, Green Member of the European Parliament. One of their common conclusions was that inequality was both a cause and a consequence of the crisis. Do you share this diagnosis, and how do you see, from your point of view of the European Anti-Poverty Network (EAPN), this situation of poverty and inequality, and which distinction do you make between both concepts? FF: Well, we would share this analysis, and from the very beginning of the EAPN, 22 years ago, we thought that the fight against poverty is very much connected to the fight for a good society for everybody. So we did not want just special measures for the poor, we wanted a society that was capable of providing a good life for everybody. And for a society to be able to deliver a good life for everybody, it needs to be a more equal society. This has been the point that the EAPN has been making, and we have been doing work, not just on poverty, but on wealth and inequality, for a number of years now, including an explainer that we have done on wealth and inequality in this area. The book by Pickett and Wilkinson, ‘The Spirit Level’, brought this discussion to a very high level of visibility and helped to make the connections and the visibility of the actions very clearly, but we have been making similar points for a long time. We believe that it is this failure across a lot of political groupings to look at the impact of inequalities, to try just concentrating on safety nets, rather than just looking at the whole of the system, has led us to the crisis that we are in now, and globally we are at levels of inequality last seen in the 1930s. It’s an enormous step backwards in terms of inequalities globally, and within Europe. So, it is a political choice, and it is about the model of development that we are pursuing. And you can see it in every country, or only in a few groups of countries? FF: No, I think in most countries in Europe, the level of inequality is growing, including the Nordic countries, where there were traditionally more equal societies. But you have had political decisions in some of the Nordic countries that they wanted to be more unequal societies. In the run up to the last Swedish election, there was a clear statement that nothing was as important as growth, not even growing levels of inequalities. This was a statement at a high level, from the Prime Minister, and the party that was re-elected. So, it is a political choice, and it is about the model of development that we are pursuing. In the ‘90s, neo-liberalism was at its highest level, don’t you have the feeling that these inequality tendencies are getting more and more visible, and are becoming a problem also. FF: It is enormously visible now, and the impact of the austerity approach has really driven these inequalities to enormous levels. We are talking about a situation of humanitarian crisis in a number of European countries. In Portugal and Spain we are beginning to have difficulties in getting medicines, you have a tripling in the numbers attending food banks. In Greece, you have an almost abandonment of all labour law, you have people going to work and not getting paid. In Bulgaria, with the official figures around 24% or 25% of people in poverty or social exclusion, if you were to use some other well respected indicators of poverty and social exclusion, you would be talking, more like 70% to 75% of the population in poverty. This is a reality which is not at all reflected in terms of a solidarity response at European level. It took Greece a long time to develop the level of debt due to an escape of wealth from the public to the private sector, but in fact, the austerity measures have managed to triple that debt in little over two years. So it is really incredible that the Troika complains about something—the build-up of public debt—but implements measures which triple it in an amazingly short space of time, which is making the future viability of Greece, and life for Greek people, really, really precarious. Do we need an emergency programme, or do we need more structural measures in the longer term, in order to face the humanitarian crisis in some of these countries? FF: There is a need for an emergency programme. We have this small programme for the most deprived, which is proposed by the Commission now, and the countries are rejecting it. So it is going to be quite hard to push it through, even it is a tiny programme, in proportion to what is needed. But it will not solve the problem. You need to start with a real recognition of what was the cause of the crisis. And you have to have a total shift in the sort of policies, to really address what caused the crisis, which was, I do not say capitalism, but unsustainable forms of capitalism, which are facilitated by hedge funds, by derivative trading, by tax havens. You need to really tackle those issues, which allowed the escape of wealth from the public sector to the private sector. That is the inequality that has grown in the private sector. You have had a total loss of respect for social knowledge, whether that social knowledge comes from social scientists, social NGOs, or people experienced in poverty, and this became very visible in the Wim Kok report of 2004, when they were reviewing the Lisbon Agenda, and then they said that Lisbon was not working. But there was nobody in that group who had social knowledge, and the bit of the Lisbon that was working was the social inclusion strategy. As a result, since 2005, we have been weakening the EU social inclusion strategy to the extent that you could say that since 2007 it has not really existed. So part of the solution is that we need a really distinct EU social inclusion strategy that works at the different levels: local, national, and European. For the moment, it seems that there is no political majority for this in the European Parliament, or in the European Council. FF: No. That’s the problem. There isn’t a political majority for this approach. It is difficult to understand why. People are very scared by the realities at the moment; it’s quite hard to make decisions. But you see now, a further 30% drop in confidence measures in the European institutions. So is confidence in the EU institutions down to about 31% now? Is that a sustainable approach for the future? Something has to happen to bring the people back into the European project, and that requires a major shift in the political orientation. But if you do not have the political voices to support this change, and to organise it, isn’t there a need for a social response, of a social movement, of a new kind of coalition, not only of the unions, but of all the other components of civil society? It really now needs people who are committed to and who really value the European social model to find all sorts of different ways to combine to try to defend that model. You had the President of the European Central Bank saying that the European social model is dead. What he meant by this statement is a little bit unclear. But that is a very big statement by the President of the European Central Bank, and that is an unacceptable vision for the future for many Europeans. And now we need to combine in all sorts of ways, across all sorts of sectors, because there are people in the institutions who are very concerned about these issues, there are even people in the police force, beginning to be concerned, in terms of law and order. There is this incredible rise of fascism, and Europe is not immune to violence. So we should learn the lessons, and I think, even if the political majority is not in this direction at the moment, the political leaders are aware, and are increasingly aware of how big the problem is. They know that they have to find some new solutions. We are moving slowly from a definition of wealth linked to incomes to a new kind of definition, much more measured to the access to public goods, for example, education, health systems, culture, and so on, and public services. How do you see this from your point of view as the European Anti-Poverty Network? FF: First, I think sometimes there is a long gap between the debates and their real influence on the political decision-making. All of this discussion of beyond-GDP indicators (well-being indicators, indicators of happiness) is important because they come closer to measuring a healthy society than some of the measures that are being used now. We also really think that this model of growth that is used now is unsustainable, both for people, and for the planet, so there needs to be at least some other way to think about growth. We have to try to help set an agenda that could get us back from the brink of the disastrous position we are in now, and get us to move into a new direction. Like Richard Wilkinson often says, he would love that when the prime ministers meet, the first thing they say is, “how’s your inequality indicator doing?” It is an image of the sort of society we’d like to get to, which I think is important. Something has to happen to bring the people back into the European project, and that requires a major shift in the political orientation. But at the same time, throughout Europe, personal indebtedness is becoming a huge problem, and it is linked to a conception of wealth and consumerism that is completely unsustainable. There was indeed a policy, which encouraged lots of individuals to take up levels of debt, which in the end, it was really clear that they would have real problems to pay back. So there are real problems of individual personal indebtedness. There is a specialist organisation in the membership of the EAPN, dealing with this issue, the European Consumer Debt Network. There is, in some countries, much better legislation to help people deal with these questions. I am not a specialist in this area, but it is a question that is very important, because if the debt levels have been allowed to grow to levels where they can never return back, then you need to find a solution that works for the people concerned. And this is connected to the model of, “spend spend growth model”, and that, for sure, is no longer a viable model for the future. We should have more fiscal discipline, we can’t be running up large public debts, but you need to move to that system in a careful way. The shock-therapy they tried to impose in Greece had a disastrous impact. We should have had something more like the Marshall Plan for Greece. FF: Yes, more planned and more balanced. And given the time that is necessary to make these very big changes. Richard Wilkinson &Kate Pickett, The Spirit Level. Why Equality is Better for Everyone, Allen Lane, 2009.